This Indian chickpea dish is a beloved staple in my home. If you don’t have cooked chickpeas, you can use canned, but it will cost about $1 more. 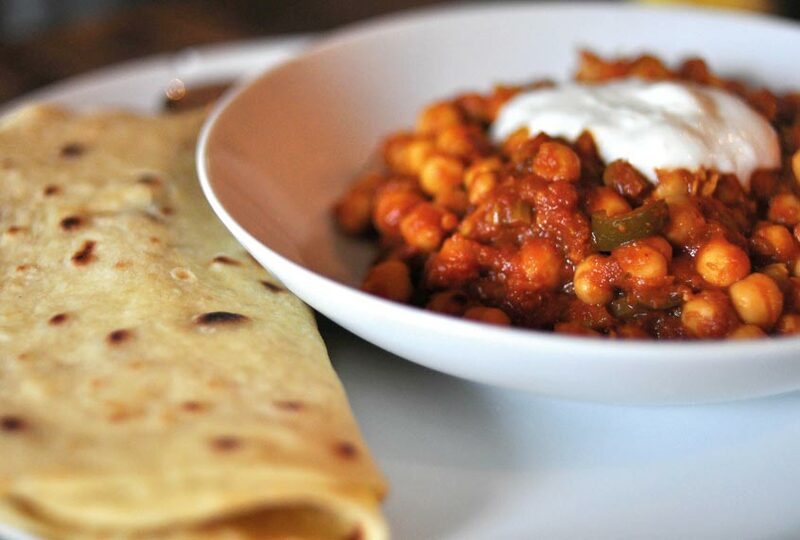 For a full meal, serve the chana masala over rice or with Roti. Combine the coriander, turmeric, cayenne, garam masala, smoked paprika, if using, and salt in a small bowl. Melt the ghee in a small saucepan over medium-low heat. Once it begins to sizzle, add the cumin seeds and stir for about five seconds until you can smell them. Add the onion and sauté until it’s a little soft, two to three minutes. Add the garlic and cook for two minutes. Add the ginger and jalapeño and cook for one minute longer. Add the spice mixture you made in Step 1, then the pureed tomatoes. Mix, then put a lid on the pan and let everything cook down, five to 10minutes. Once the tomato has reduced and the ghee starts to separate from the sauce, add the chickpeas and ½ cup of water.Stir, bring it to a boil, and then decrease the heat to a simmer. Cook for 10 minutes, and then squish a few chickpeas with the back of a spoon to thicken the sauce before serving. Garnish with cilantro and Raita.